I realize that the 4th of July was almost 2 weeks ago, but I wanted to share the recipe I used to make an awesome Two Layer Jello Cake. This cake can be made with all different colors for any occasion. It looked like a regular cake from the outside. But this is what it looked like when it was sliced! And it was so simple. Here’s how to make it. Bake the white cake according to directions on box. Once it has cooled completely leave the cakes in the pans and poke holes into the cakes using a wooden skewer or fork. A skewer works better. Then mix your jello (but don’t follow package directions this time). Bring 1 cup of water to a boil (about 2 minutes in the microwave) and mix it with the strawberry jello. Pour it over one of the cakes very slowly letting it seep into the holes. Then do the same with the berry jello. Cover both cakes and put them in the fridge overnight. Remove cakes from the pans and place them one on top of the other on cake stand with a layer of Cool Whip in the middle. Then frost the entire cake with the Coop Whip. Refrigerate until ready to serve. Jello cakes are great for summer when you’re looking for a lighter dessert to serve on those hot days! It was a restless night around here for some reason. We were out of town this weekend visiting my parents and sometimes I think it takes Harper a day or two to adjust back to sleeping by herself once were back home. She woke me up a couple times in the middle of the night and then early this morning. I figured since I was up early that I might as well bake some homemade banana bread muffins with my over-ripe bananas. 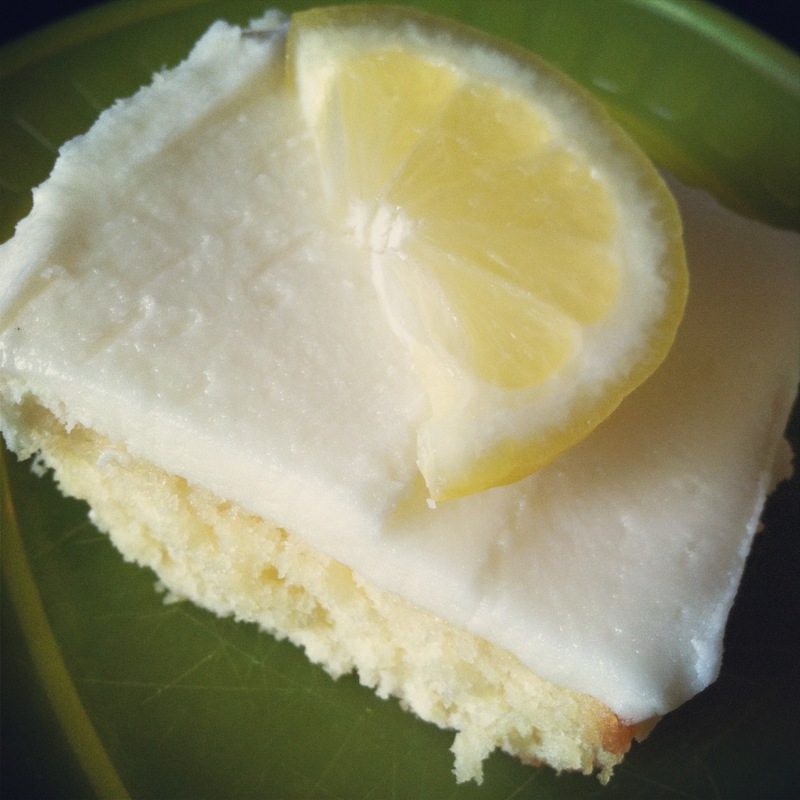 This is a super easy recipe that I found on Pinterest a while back. The only thing I do to adjust it is to add some chopped walnuts to the tops of half of them. The kids don’t like the nuts, but Jeremy and I sure do. Snip the corner of the bag and squirt the batter into a lined muffin tin (if you don’t want to clean the pan, line it with tin liners so the grease doesn’t come through). Don’t make the hole very big at all because the batter is very runny. Pinch the corner between each muffin. **I make my mix in a bowl instead of using a plastic bag. **I don’t add the glaze. I’m sure it’s delicious, but we like butter on our banana bread so that’s what we put on our muffins. **This time I used a mini muffin pan to bake them because my big one was dirty and I was too lazy to wash it. The mix made almost two batches and instead of 20 minutes, the baking time was 12 minutes. 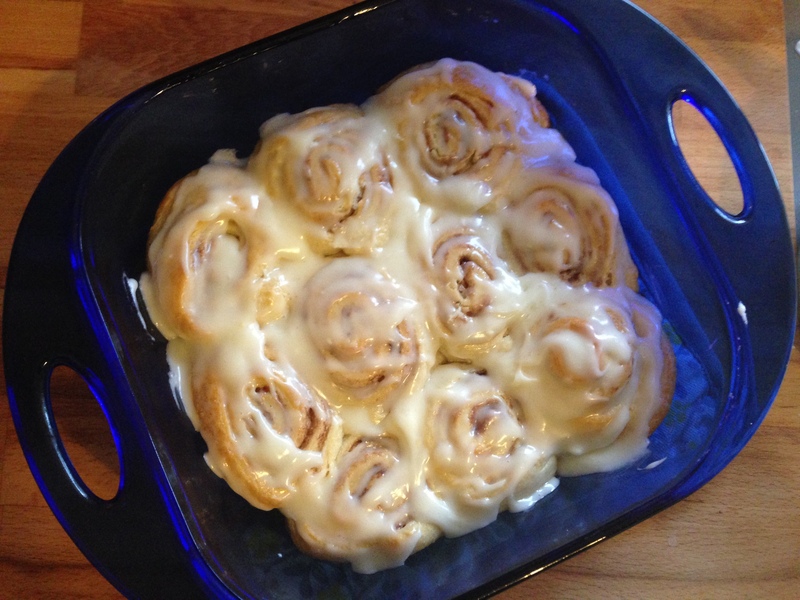 This is a quick, easy recipe using ingredients that I always have on hand. But the best part is the kids love them. Give them a try! Oh, and check out Yammie’s Noshery for tons of other delicious recipes. Last year I pinned three recipes for Strawberry Freezer Jam and never got around to making it before strawberry season was over. This year we went strawberry picking at a local u-pick farm and came home with a ton of berries. My whole plan was to pick enough that I could try my hand at making freezer jam. Freezer jam is a much simpler process than regular canning jam. There is no major prep work, no sterilization or sealing process. I finished my jam within 30 minutes. It’s delicious. It has a fresh berry flavor that just makes you think of summer. Here is the recipe I used to make my Strawberry Freezer Jam. Pour apple juice into a medium saucepan and whisk in pectin. Bring to a full rolling boil over medium-high heat, and boil one minute. Remove from heat and mix in crushed strawberries, stirring for one minute. Add sugar (more or less depending on the sweetness of your strawberries) and mix until well combined. Ladle into freezer-safe containers (I usually just use pint canning jars) leaving about 1/4 inch at the top of the jar for the jam to expand. 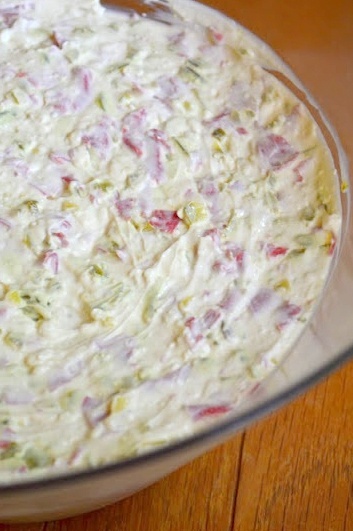 Add lids and chill in refrigerator until set (usually in about 2-3 hours). Store in freezer for up to one year or refrigerator for up to three weeks. I didn’t end up with 3 cups of crushed strawberries like the recipe calls for (we had already eaten a bunch of the berries and I gave some to my mom). I had a little over two cups, so I had to adjust the recipe a bit by using 1 1/8 cup of apply juice, two tablespoons of pectin and only a cup of sugar. I was able to fill two pint jars which I picked up at the Dollar Tree for $2.00. Then I decorated the jars with some fabric strips. The jam keeps in the fridge for 3-4 weeks and in the freezer for up to a year. I can’t decide if I want to keep both jars for our family or if I should gift one to a friend. It’s so beautiful and delicious I feel like I should share! I think I’ll end up making more freezer jam before the summer is over. We plan to go back to the u-pick farm for some raspberries in July and I saw that you can also make peach freezer jam. That sounds amazing! I would definitely recommend trying a freezer jam recipe. It was so simple and totally worth the 30 minutes it took to make. Yesterday I mentioned that I took some homemade pumpkin bars with us on our picnic. 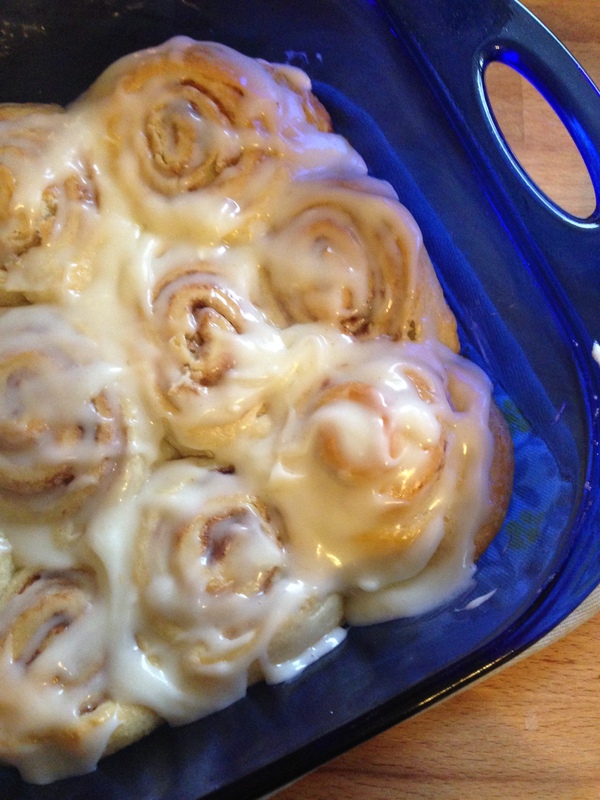 It was a new recipe that I found on Pinterest and they turned out great, so I thought I would share it with you today. 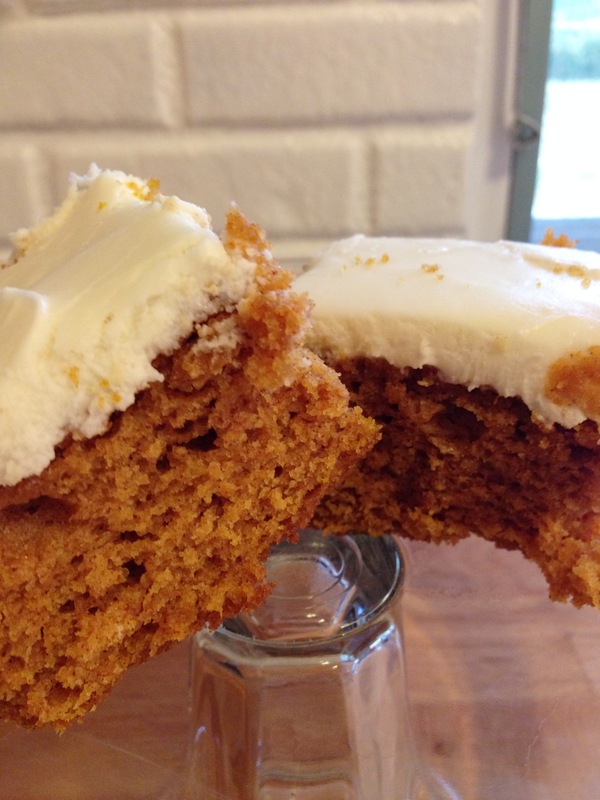 Pumpkin bars are one of my favorite pumpkin treats, and this recipe was perfect. Original recipe found here at Hoosier Homemade. I followed this version of the recipe to make my frosting because we tend to like more frosting than what the original recipe made. Preheat oven to 350 degrees. Sift dry ingredients (flour, baking powder, cinnamon, salt & soda) and set aside.In a large bowl, combine eggs, sugar, oil and pumpkin until light and fluffy. Add the dry ingredients, gradually. Mix well. Spread batter in a greased 15x10x1 baking pan. Bake at 350 degrees for 25 – 30 minutes or until a toothpick inserted comes out clean. Cool completely. Cream together butter and cream cheese. Add vanilla, mix well and then gradually add the powdered sugar, beating until mixture is smooth. Frost bars. 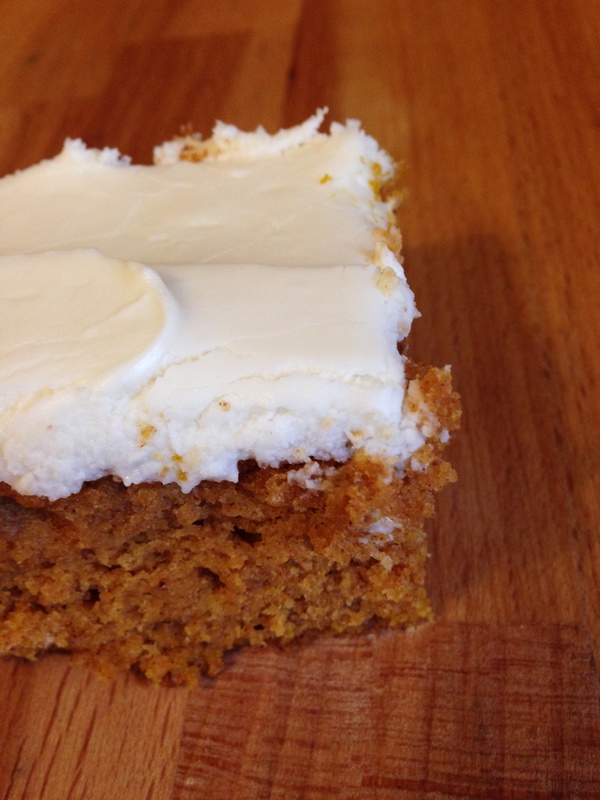 This is the second pumpkin bar recipe that I’ve tried and I liked this one better. 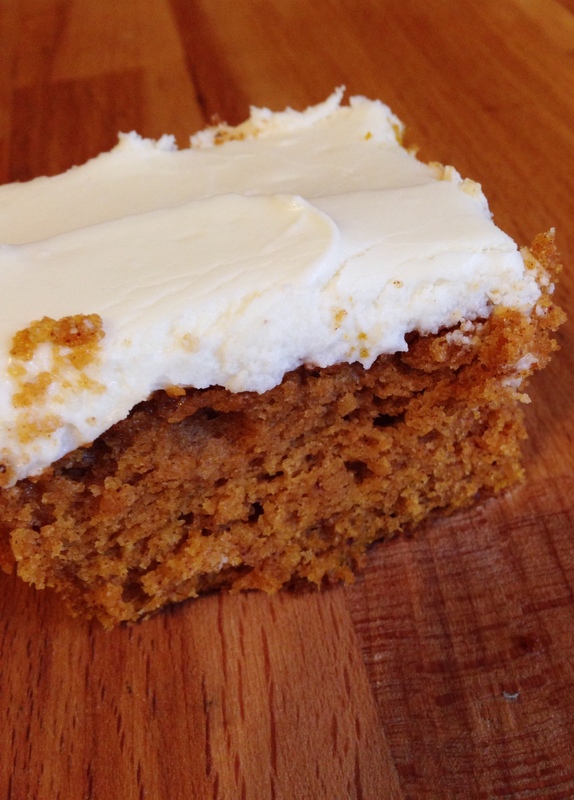 If you like pumpkin bars you should definitely give this recipe a try! I mentioned yesterday that we made pesto with basil from my little container garden. It was fantastic! So fresh and full of flavor. I’m so, so happy that I decided to grow basil. Have I mentioned that before? Ha! 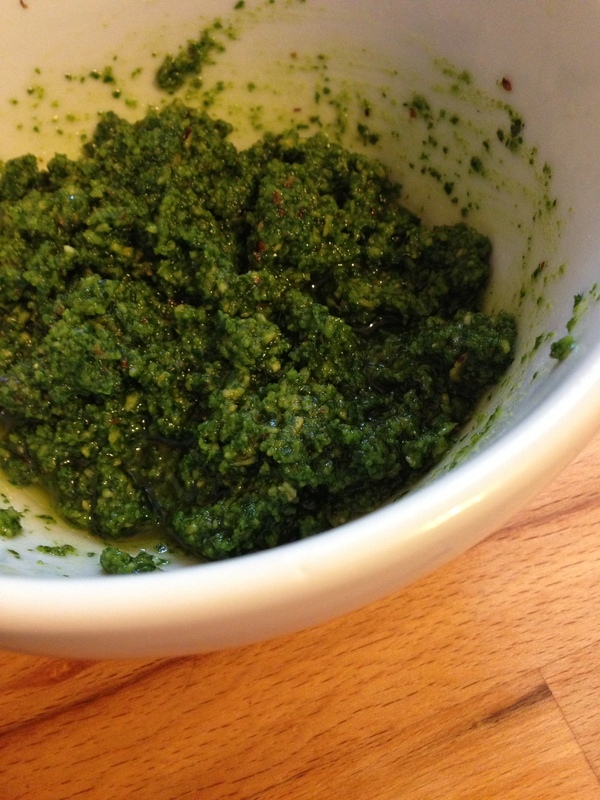 It was so good that I thought I would share the recipe I used to make the pesto. There are about a million pesto recipes, but I found this one on Pinterest. You can find the original post here at www.mybakingaddiction.com. In a food processor or blender, combine basil and about 2 tablespoons of the extra virgin olive oil, blend into a paste. Add pine nuts, Parmesan cheese, garlic, and remaining oil and pulse until smooth. Season with salt and pepper to taste. Notes: I didn’t have pine nuts, so I used toasted almonds instead and it was delicious. The recipe made enough for us to freeze half of it for later. Score! 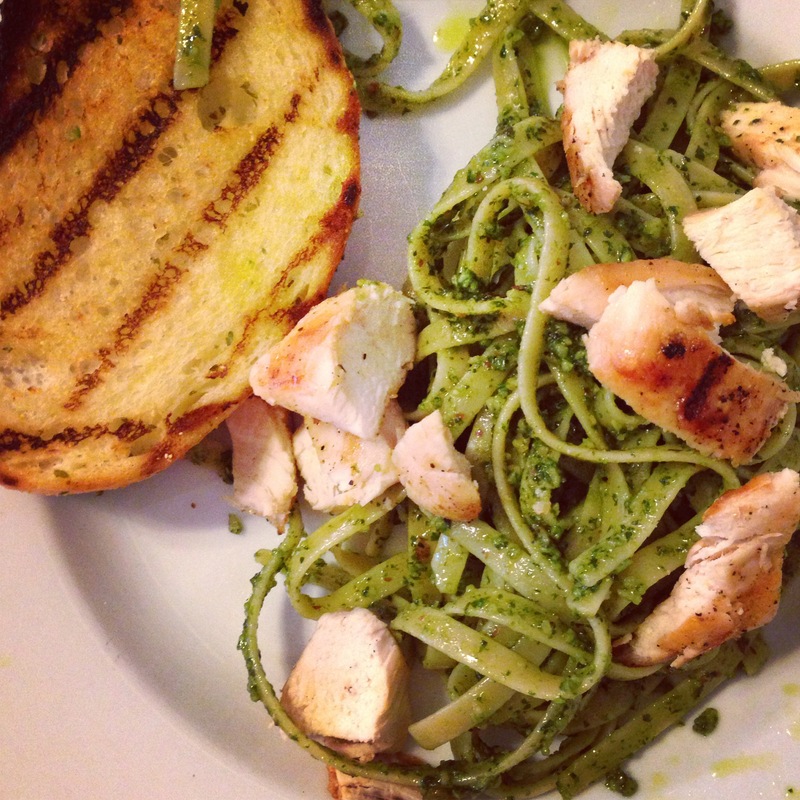 You can totally eat the pasta with just the pesto and it’s awesome, but we wanted to add some grilled chicken. Loved it! I can’t wait for the basil to replenish so I can do another big harvest. I’m hoping to be able to freeze at least three servings of pesto to have this winter. 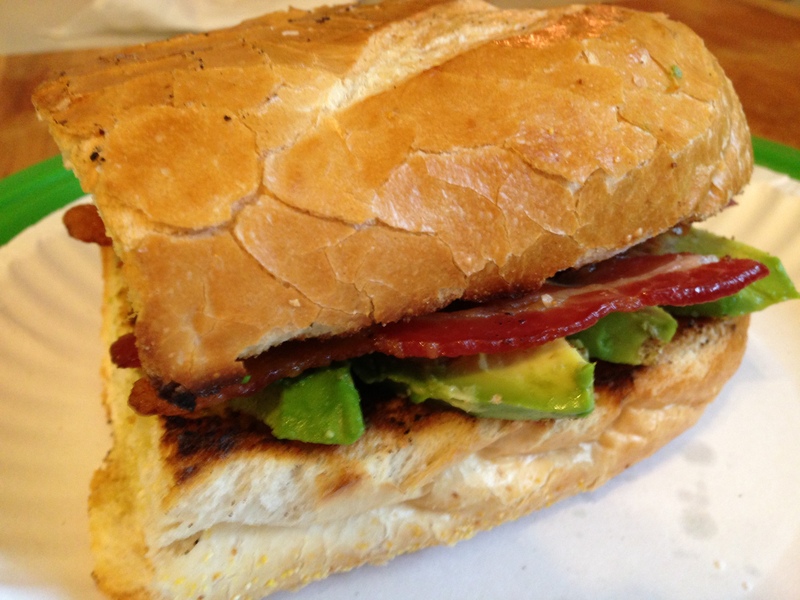 I love me a good sandwich and this one has been our favorite this summer season. It’s simple and so, so delicious. 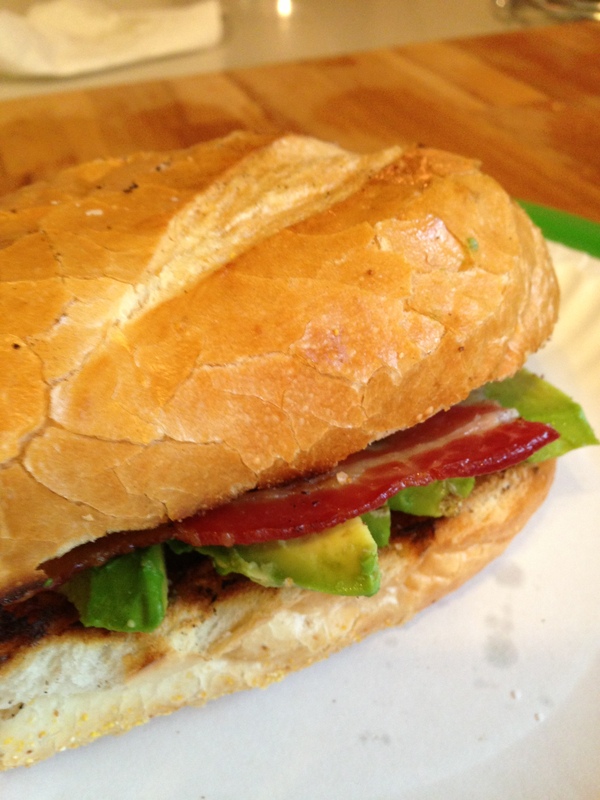 I mean, there’s basically only three ingredients; bread, bacon and avocados. You can’t go wrong. This is how you make it. Cook the bacon. We make ours in the oven, and cook it until it’s nice and crispy. While the bacon is cooking, drizzle a little olive oil on the bread of your choice. We used a french baguette sliced in half. Once the bacon is done, just pop the bread into the oven under the broiler for a couple of minutes. Slice the avocado last so it doesn’t brown. When the bread is toasted to your liking, top one slice with the bacon and avocado slices and sprinkle a little kosher or sea salt on the avocado. That’s it! Enjoy! 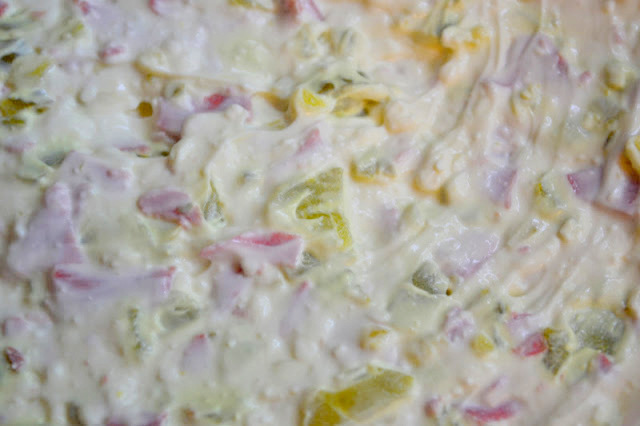 This would be a fantastic picnic sandwich. You could also add tomatoes or maybe some type of cheese, but we like it simple. I would eat these at least once a week, but I don’t think I need that much bacon in my diet! I’m always on the lookout for simple sandwiches. Especially in the summer when I don’t want to turn the oven on.